StelPro’s STE402NPW+ is an electronic thermostat for 120V/208V/240V baseboard heating and convectors including those with forced air fan models. It has a single programmable mode that lets you automatically lower the temperature once per 24-hour period and comes with a lock option at a maximum temperature. The unit also comes with a backlit screen for ease of use at night time. 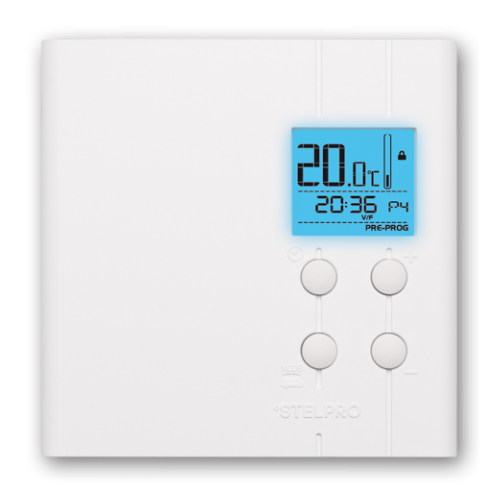 The thermostat comes with a frost-free warning which will notify you with a snowflake icon that the temperature is between 3°C (37°F) and 5°C (41°F). You can set a minimum temperature to ensure frost control. The LCD screen can display temperature in either Celsius or Fahrenheit depending on your preference and has an accuracy of ± 0,15 °C (0,27 °F).